In the closing days of August 1862, Union General John Pope's Army of Virginia suffered defeat at the Battle of Second Manassas. The Union army while beaten was still intact and retreated toward the fortifications around Washington. General Robert E. Lee, hoped to circle his Confederate troops around the retreating Union forces and block their route and give his troops a clear advance into Washington. Lee chose to block the Union Army at the Jermantown crossroad, just west of Fairfax. Lee's strategy was to take Stonewall Jackson's Corps around the north side of the Union troops in a long, flanking move along the road that is now modern-day Route 50. To divert attention from Jackson's flanking move, Longstreet's Confederate Corps remained visible behind the Union Army on the road that is now modern-day Route 29. Meanwhile, Jeb Stuart's cavalry of 5,000 rode ahead of Jackson's Corps to scout Pope's movements. Lee planned for his armies to converge west of Fairfax and block Pope's Union Army. As Jackson's men circled around the Union troops, Pope realizes that a flanking move was underway by the Confederates. Jeb Stuart troops attacked a wagon train east of Chantilly, Va., which alerted the Union Army. Pope then sends Union General Issac Stevens and a small force of 4,000 soldiers toward the Confederates. Stevens' forces surprised Jackson's men at Ox Hill, located near the present-day West Ox Road and Fairfax Town Center. Jackson then abandoned his march toward the crossroads and formed into a defensive position. Stevens immediately attacked the Confederate brigades who were beginning to deploy into a defensive line. Stevens' first advance stalled due to a massive volley that caused numerous casualties among the Union ranks, including the general's son, Captain Hazard Stevens. 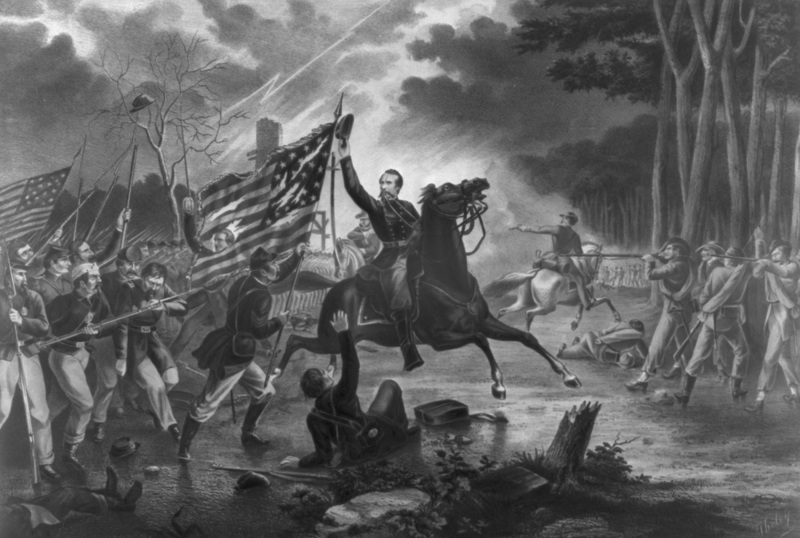 General Stevens, distraught at seeing his son fall in battle, attacks a second time while Jackson troops were still off balance. Stevens grabbed a regimental flag from a wounded color bearer and personally led the charge becoming an easy target while holding the battle flag and was quickly shot and killed. While the Confederates were initially caught off-guard by the Union attack, they soon begin to take control of the battle, driving the Union forces back through the mud and rain. As the Union troops are pushed back, General Philip Kearny arrived with reinforcements. Hoping to reinvigorate the attack and urge the Union forces forward, Kearny pushed ahead of his men despite being warned of the danger. With poor visibility from the heavy storm, General Kearny rides right up to the Confederate line, then realizing his mistake, turns his horse and galloped back toward his division but he is to late as the Confederates open fire shooting him off of his galloping horseand killing him. The body of General Kearny was returned to the Union Army with a personal note from Robert E. Lee. At the time, it was rumored that Lincoln was thinking of replacing McClellan with Kearny as the commander of the Union Army. As the drenching rain continued, dry black powder cartridges became scarce and rifles misfired so often that the commanders told their troops to "give them the bayonet." A series of bayonet charges ensued and for over two hours fierce hand to hand fighting took place. With heavy rain and chilling temperatures dampening the soldiers will to fight, the Union army withdrawls into the darkness leaving the Confederates holding the field. While technically the Battle of Ox Hill/Chantilly was a Confederate victory, Lee failed to accomplish his goal of stopping Pope's Army and marching into Washington. The Union Army retreated to Washington and the Confederates turned north heading towards Sharpsburg, Maryland and Antietam. Union losses were approximately 1,300 casualties out of 6,000 troops engaged. Confederate losses were approximately 800 casualties out of 15,000 troops engaged. The Eighty-Eighth did not suffer any losses in the Battle of Ox Hill / Chantilly. 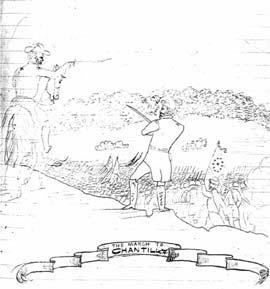 The Battle of Ox Hill / Chantilly was a Confederate Victory and was the last battle in the Northern Virginia Campaign.